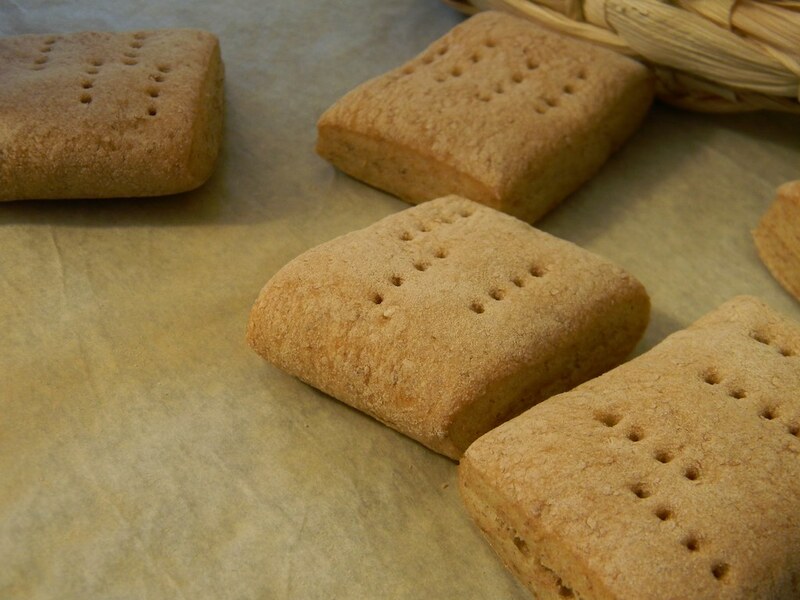 Spelt "Biskers" #BreadBakers | What Smells So Good? In the bowl of a stand mixer fitted with the dough hook, combine the yeast, flours, salt and baking soda. Knead on low speed for 10 minutes, until it is soft and elastic consistency. Add sprinkles of flour as necessary - the dough should be a medium firmness (akin to whole wheat sandwich bread) and clean the sides of the bowl. Place into a greased bowl, cover and place in the refrigerator one hour, up to overnight. Preheat the oven to 425 F and line a baking sheet with parchment paper. Roll out the dough no thicker than 1/8" and letter-fold (like puff pastry). Roll out again as thin as possible. Cut with a pizza cutter into rectangles or squares (you can use a cookie cutter for festive crackers too) and place about ½” apart on the baking sheet. Bake for 20 minutes, until brown and crisp.